The Oxford Bus Museum has send its 1961 Dennis Loline II (304 KFC) to Selby in Yorkshire to have its front end straightened and for a complete repaint. The last repaint was over 20 years ago. 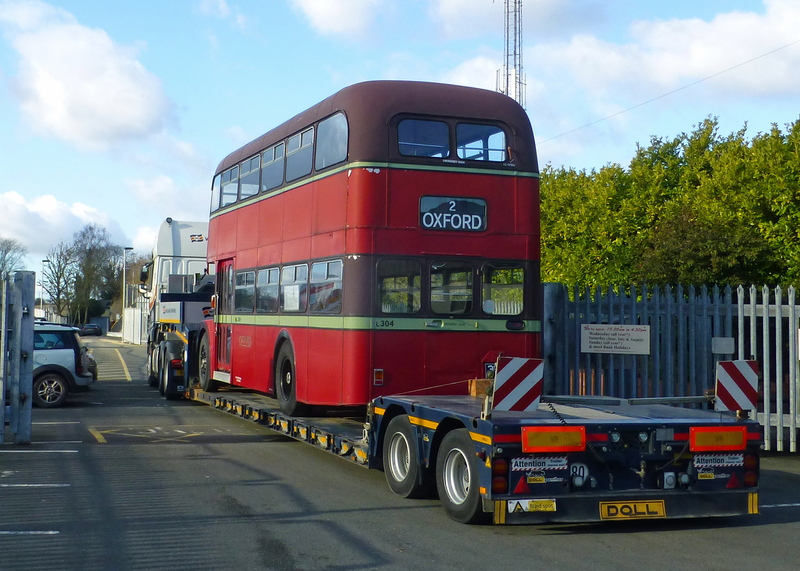 From 1930 to the late 1960s, the Oxford Bus Company normally chose chassis built by AEC. An exception to this was the purchase in 1961 of five Dennis ‘Loline’ Mk II low height double-deckers. Even so, they were fitted with AEC engines instead of the usual Gardner power units. Dennis, based in Guildford, had bought a license to manufacture its ‘Loline’ model derived from the Bristol Commercial Vehicles company’s ‘Lodekka’ model. Bristol was then a nationalized company and unable to supply buses on the open market to private sector companies like Oxford. Bristol had introduced its ‘Lodekka’ design in the early 1950s with a lowered chassis frame, transmission line angled towards the offside of the bus and fitted a drop-centre rear axle. This meant the overall height of the bus could be reduced and such a design was an attractive replacement for the earlier ‘Lowbridge’ buses. There was no need for the offside sunken gangway and rows of four-abreast seats on the top deck. Oxford specified bodies built by East Lancashire Coachbuilders of Blackburn. The five ‘Lolines’ introduced the ‘Low height’ concept in Oxford but were followed by a return to AEC who supplied 23 ‘Bridgemasters’ and, by 1967, 43 ‘Renowns,’ up to no 371, the last AEC Renown, which is preserved and resides at the Oxford Bus Museum in Long Hanborough. The Dennises were not popular in the fleet being non-standard and could be found languishing in the Cowley Road garage during the day. It was unusual to see all five on the road at the same time. When new, 304 temporarily carried the ‘L’ prefix in front of the fleet number as used for earlier ‘Lowbridge’ buses like L166 but this was soon removed. It was not applied to any of the other 70 ‘Lowheight’ buses numbered 301-371 inclusive. The Oxford Bus Museum tells the story of bus and coach travel around Oxfordshire over the last 130 years. Our exhibits include historic preserved horse-drawn vehicles, buses, coaches and a wide selection of artefacts (bus stops, ticket machines, timetables, posters, staff uniforms) and lots of fantastic photos illustrating our diverse public transport history. Since 2004 we've also been home to the Morris Motors Museum, which charts the story of how these classic British cars and commercial vehicles were produced at Cowley, in the city. Our impressive collection of vintage Morris vehicles represents those produced during William Morris's life. We also have a unique collection of 40 vintage bicycles. It wouldn't be Oxford without bikes! The museum is a charity and run entirely by volunteers. There is free parking and a café. The museum is 70 yards from Hanborough Railway Station just off the A4095 in Long Hanborough. The full address is Old Station Yard, Main Road, Long Hanborough, Witney OX29 8LA. Open Doors without a Door.